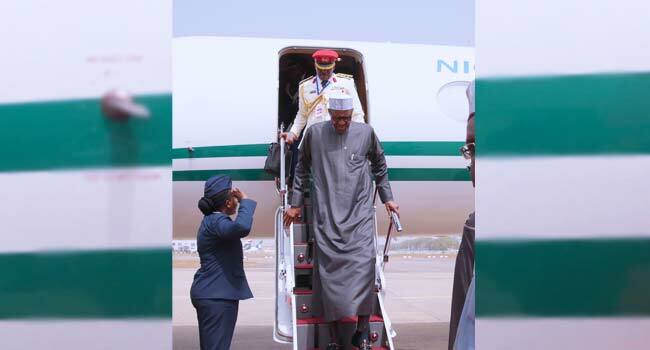 President Muhammadu Buhari has returned to Abuja after a successful outing at the 30th session of the Africa Union summit held in Addis Ababa, Ethiopia. He was welcomed on Tuesday at the Nnamdi Azikiwe International Airport by the FCT Minister, Mallam Muhammad Musa Bello, Minister of State for Aviation, Senator Hadi Sirika; Director General of NIA, Ahmed Rufai; Attorney General and Minister of Justice, Abubakar Malami, and the Chief of Staff, Mallam Abba Kyari. The President left Abuja for the summit in Ethiopia on Friday, January 26, 2018. He joined 14 other members of the Peace and Security Council (PSC), a standing organ of the AU for the prevention, management and resolution of conflicts as they discussed matter relating to corruption, the persistence of violent conflicts and crisis situations in some parts of the continent, an upsurge of Internally Displaced Persons (IDPs) and refugees, climate change and its consequences, as well as the issue of the derailment of national development programmes. Other issues that were discussed include the security situation in Somalia, South Sudan, Libya, Guinea Bissau, the Central African Republic and the Democratic Republic of Congo (DRC). As the President arrives the country today, Nigerians and Africans are hoping that there will be less talk and more of implementation of some of the resolutions reached at the summit.